Home / Unlabelled / What you should know about the world's most expensive car. What you should know about the world's most expensive car. Just about 4 hours ago the world most expensive car was unveiled, sold to an unnamed buyer for at least $11m (£9.5m) before tax. 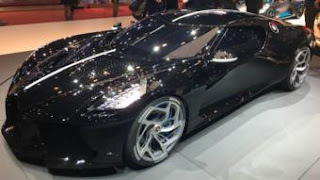 La Voiture Noire, a one-off hypercar unveiled at the Geneva Motor Show, has already been sold to an unnamed buyer for €11m (£9.5m). These are the things you should know about the car before you think of getting yours. 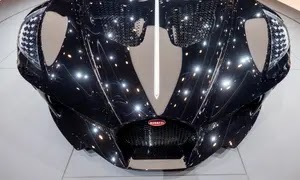 1 It is manufactured by French super car maker bugatti. 2 The car has a jet-black carbon fibre body and a 1,500 horsepower 16-cylinder engine. 3 This car reaches 62mph in 2.4 seconds and has a top speed of 261mph. 4 La Voiture Noire, Bugatti says, pays homage to its Type 57 SC Atlantic. Just four were made between 1936 and 1938, and fashion designer Ralph Lauren is the owner of the last Atlantic produced. 5 The car was built to celebrate Bugatti's 110th anniversary. 6 The exact price is not being revealed, but is thought to have overtaken the previous new car record - about £8-9m for a Rolls-Royce Sweptail. 7 The engine power is about 20 times a Ford Fiesta. 8 Ferdinand Piech, grandson of Porsche's founder, is thought to be the buyer.